With increased demand for quality and reliable electronic devices, many original equipment manufacturers (OEMs) are committed to performing extensive testing to ensure products do not fail within their guaranteed specifications. A 3-point bend test determines the maximum force until break for destructive testing and deflection at the center of the device. While a 4-point bend test determines maximum stress along a larger region of the device to identify potential defects. It is important to accurately measure the force required to break and the deflection of the device or component for research and development purposes, as well as quality control. 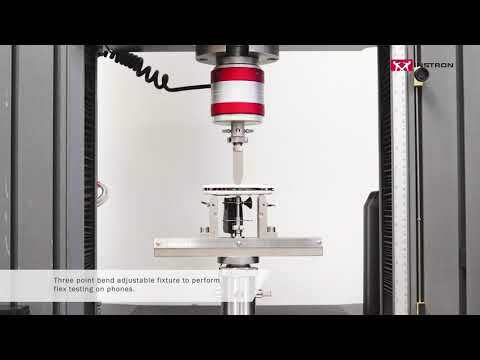 Instron offers flexure fixtures to accommodate a range of device sizes for bend testing. The 2810-400 flexure fixture includes several anvils of various sizes to fit the specific application and requirements. This flexure fixture also includes an upper anvil to perform 3-point bend testing and upper anvils to perform 4-point bend testing. In addition, Instron’s micro bend fixtures (2810-410 series) allow for 3-point and 4-point bend testing on several microelectronic components. An extensometer, which can be integrated directly into Bluehill® Universal software, can be used to measure the deflection. Bluehill Universal offers a wide range of calculations and also allows the user to create custom calculations.